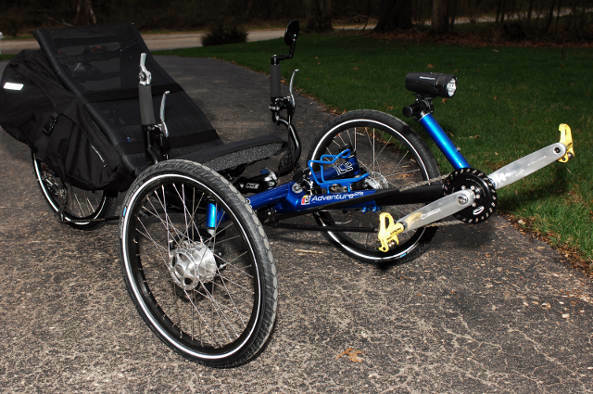 First of all, thank you so much for taking the time to put together such a detailed and professional web site devoted totally to Recumbent Triking. The site is very informative and it contains an abundance of information. Most of the information I find on here about the subject is sketchy at best and lacking dedicated content. What you’ve done here is just wonderful! I am happy to be apart of it and contribute as much information and input as I can. 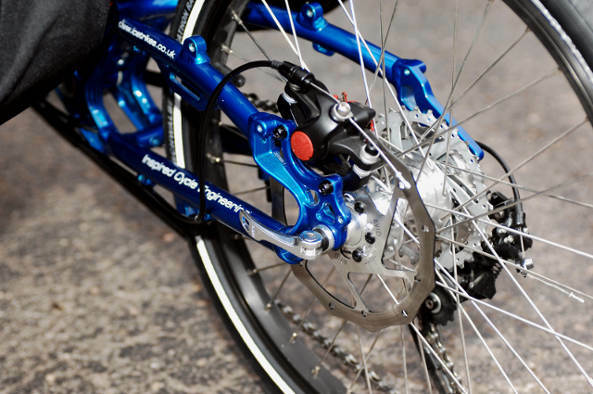 I began my research into recumbent triking in 2008 after reading about the concept in a biking journal. At that time in my life I was riding conventional 2 wheel upright bikes (Mostly a Trek FUEL, as I loved the ability to go anywhere on or off road). After a few years of the Trek FUEL, I began to notice I could not go the long distances I would have liked and it was difficult to take the necessary items needed with me on a trip of any distance. 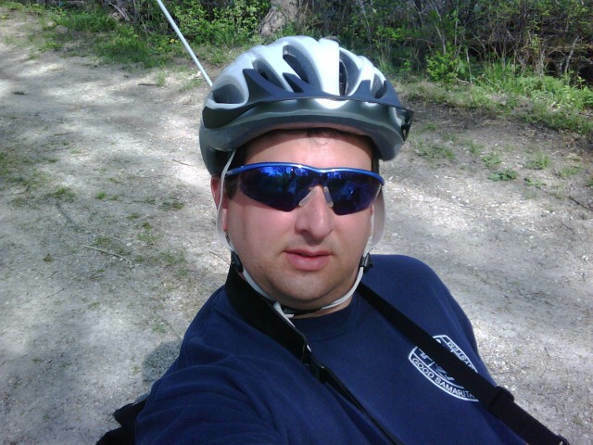 I am a career Fire Department Lieutenant and Paramedic with a very busy agency and with 24 years of abuse to my body, I needed to find a better way to cover the distance I wanted, but without the pains to my neck, shoulders back and knees that I regularly experienced after a long ride. 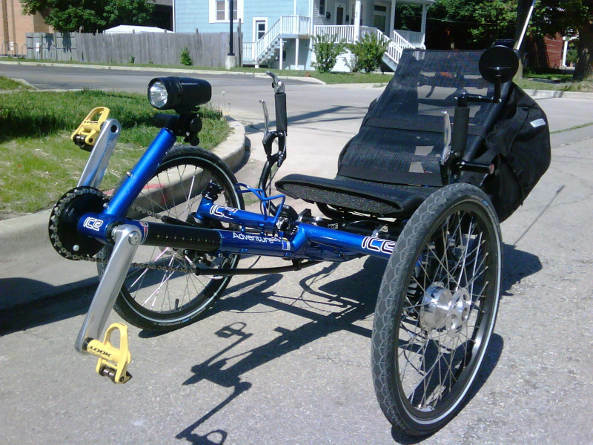 Recumbent Trikes were the answer! I could see this was going to be a very expensive investment and with that I was also in the market for the perfect dealer, someone that treated me like I was the most important customer they ever had… I found that with The Bike Rack in St. Charles, Illinois. Hal and his family-owned custom shop were outstanding. Their entire staff treated you as though you ARE their most important customer. My new ICE Adventure 2FS arrived in March of 2010 and was then customized in their shop with several changes and additions I requested. Needless to say, they did I great job! The bike rides like the wind and was custom adjusted to my personal body type and riding style. My preference for riding sits between rural black tops and semi-flat bike trails. Although I am in Chicago, I enjoy the open road and scenic beauty of a county ride. 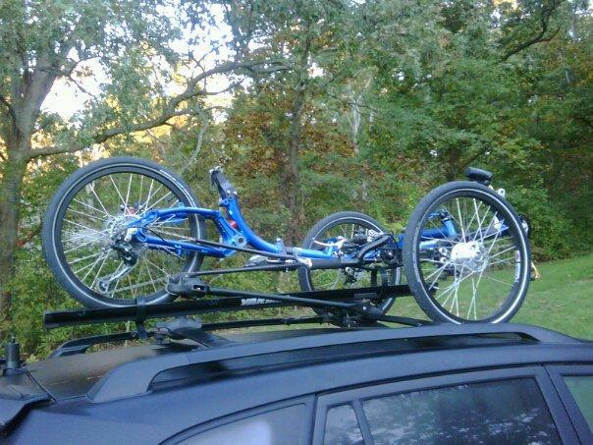 I keep my trike at the ready and take it with me most everywhere I go securely locked to my roof top Yakima rack. This way, no matter where I go, I can grab a ride or be ready to ride if the opportunity affords itself.